Our old house had a TALL foyer. The space itself was open to our front two rooms, but the ceilings soared. 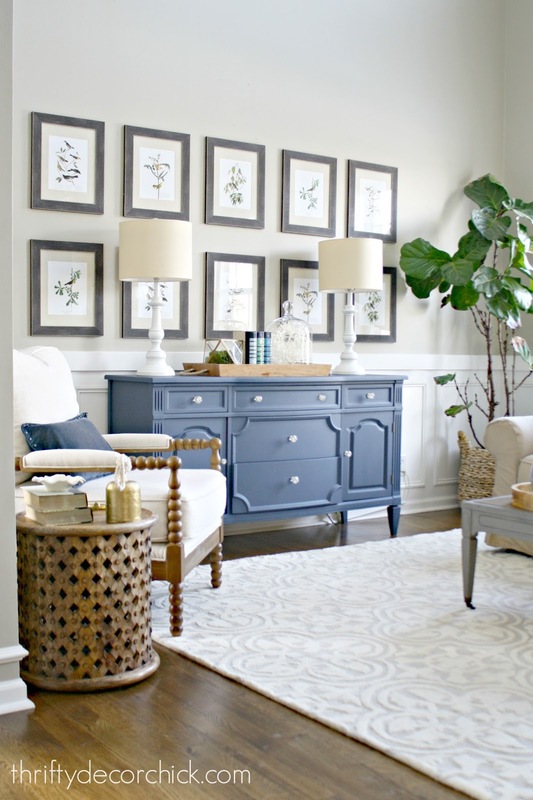 It's what made us fall in love with the house 14 years ago as we toured model homes. Later on when I was working as a decorator I had a client who had a foyer that was the very opposite of ours. The ceilings were lower and then when you walked to the back the rest of the house opened up. I fell in love with it, which surprised me because I loved our two story entry so much. The only new additions to this space are the lanterns (I've searched forever for lanterns that aren't super expensive, these are lovely and a great price for the size!) and the rug -- I got that at At Home for $40. I've never had a candle in the entry before and I'm not sure why. It's so cozy! 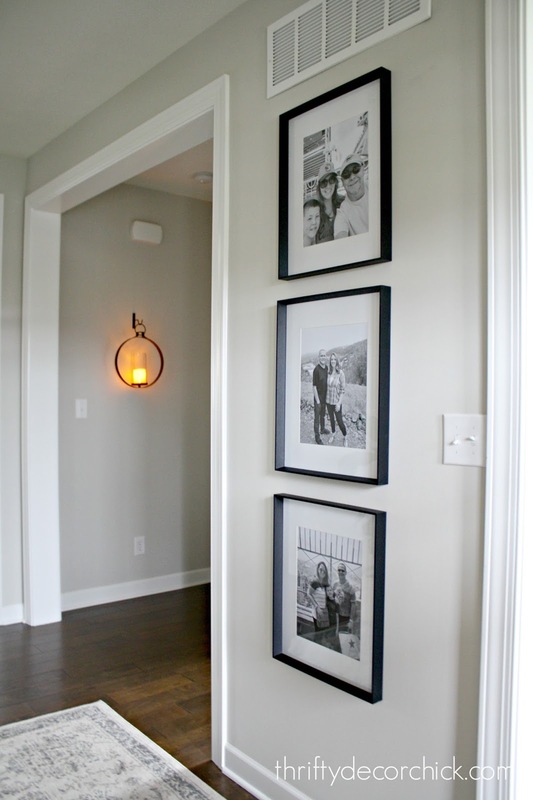 The back wall is a little nook that goes to other spaces and I hung my round hanging pendant sconce. I love that thing and have a fake candle with a timer inside. I wanted something simple on that wall because of the three frames so close by. 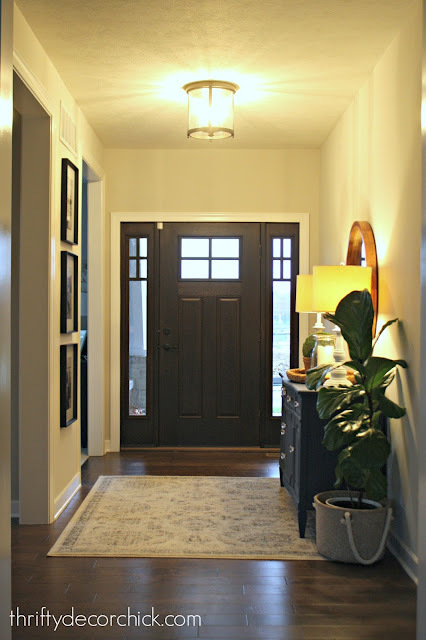 you missed the other finished spaces I've shared so far you can check out the powder room here and the mud room/laundry combo as well. I am really enjoying watching you share your new Home with us! We moved over the summer, and while our spaces seem very diffeeent, I sill get so much inspiration from you! Also, I’m local so I love when you share where you purchased your finds so I can scout them out too! I love the lanterns. Are those a winter addition or will they be year round? 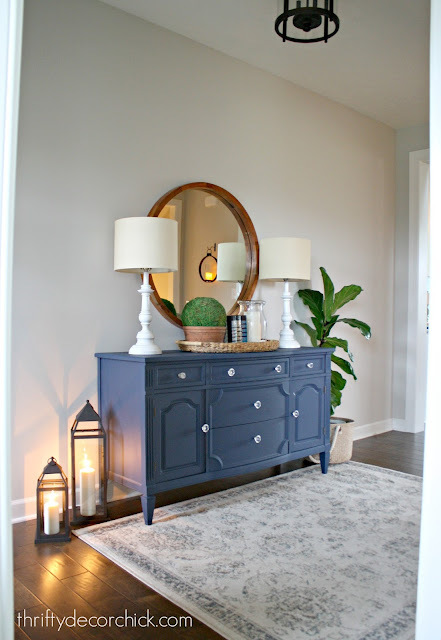 I love your foyer! The dresser is perfect .... again! Love this so much. Loving seeing the new house! It’s lovely! We also just moved into a new build. Thank you for sharing your ideas! I noticed you have glass in the door - we do also. We want to find a way to provide privacy but not stop the light coming in. Ideas for that? Thank you! 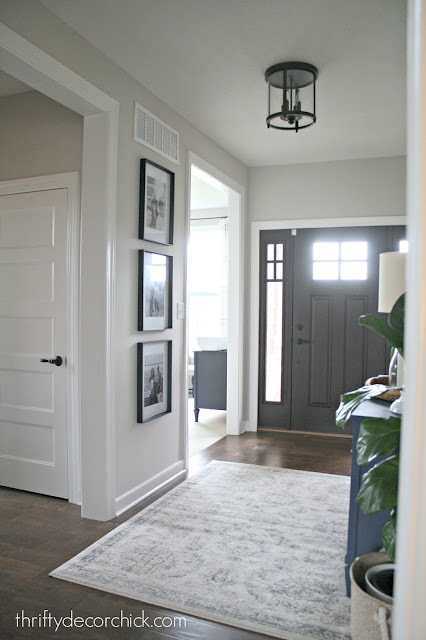 Is your ceiling in the foyer angled? 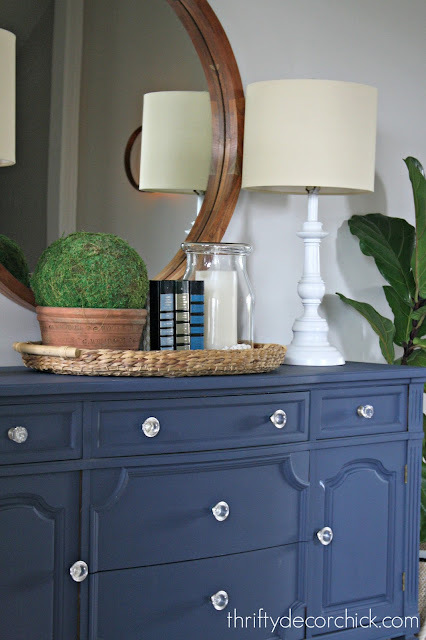 Ours is & I cannot find a flush mount light fixture I love but I love yours! I love the ambiance of the foyer. So warm! I just love your place! And the dresser is great! I'm loving your new place just like I loved your old place. Have always loved your beautiful dresser. Wish I had the space for something similar in my entryway. You're right! it is SO welcoming! I love the plant. Adds a nice touch! Looks gorgeous! 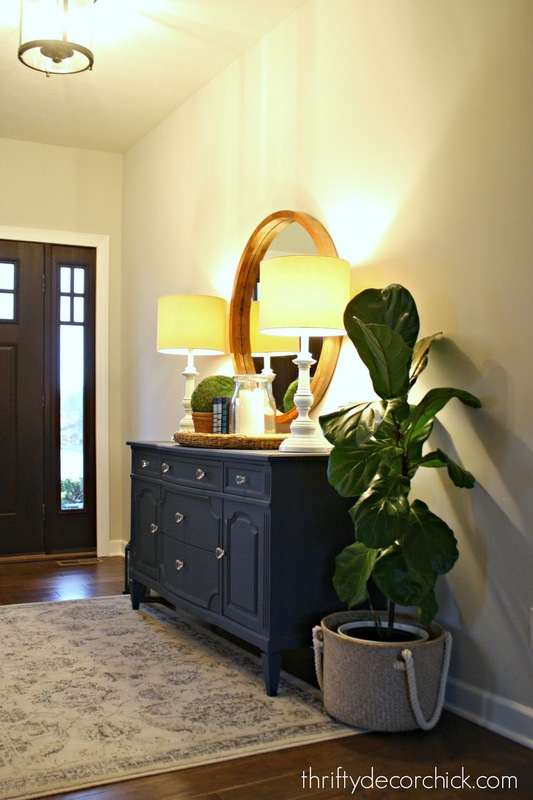 I'd love to have a fiddle leaf like that but I am worried my 2 cats will use the planter and dirt as a kitty litter box :-( . I guess your kitty is good. My female probably wouldn't but the boy very likely would. sigh. They have nice looking artificial ones now. Young House Love Has blogged about them. We have a cat that used to do that occasionally -- I put rocks on the soil (from the dollar store) and they don't like the feel of them. You could try that! That looks awesome Sara! Nice to come home to. I love the new house and the foyer is lovely. I'm curious about the interior door color you used. I noticed a few posts back that you talked about things you did again in your new house. Your last house had black doors, but in your new one I just see white. 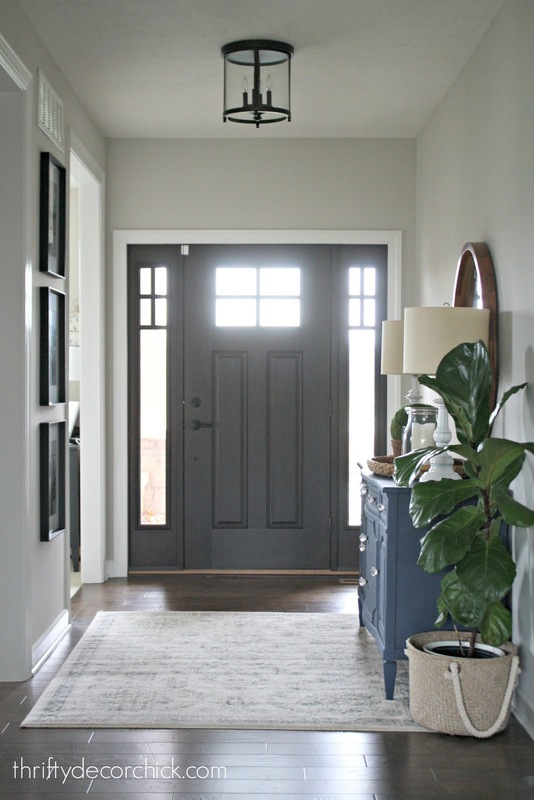 I love the look of dark doors. Did they hold up well in your last house? Ahhhhh looking good, Sarah - you are so lucky to have a proper entry, my house is totally lacking that!! It looks beautiful and definitely very cozy. One idea... if you paint the vent above the 3 pictures the same as the wall color, it would blend in so much more and help the photos be what stands out! It's glossy so regular latex paint isn't going to adhere. If I find a spray paint that matches I may try it someday! Your entryway is beautiful! I'm currently trying to style my entryway and appreciate these photos. It gives me several ideas. QUESTION: What size are your black frames with the photos and where did you get them? They look large and I'm trying to find large square frames and haven't had much luck. I think they're around 11x14 and I got them at HomeGoods! I love your new house and I’m so happy for you. Where did you get those spindle chairs you have in the second picture with your blue chest?